Vale Funeral Service: your friendly, local, professional and independent funeral director serving Barry and the surrounding area. We are committed to providing a professional, personal and supportive service to you at any time you may need us. We will help you with care and compassion while assisting you with the funeral arrangements. We appreciate that the funeral you want is as unique and special as the loved one you have lost. That’s why we strive to make every service the personal tribute that your loved one deserves. It is a rare privilege to be a Funeral Director, to stand in a sensitive position at a crucial time in the midst of your family, knowing that the high standards of our service and our reputation will help you through one of the most difficult times in your life. As a husband and wife team, we are not part of any large conglomerate of companies, so you can be assured of a service that is unique, professional and personal. From the moment you contact us, you will exclusively deal with us – Lyndsay and Nicola – so that you receive the personal care that only a family firm can offer. Thank you for entrusting me to care for Colin. I hope that everything asked of myself and my staff was carried out to the highest standards we are known for. So helpful in guiding us as a family through this difficult time. All staff showed compassion and care. Thank you so much. Lindsay and his team were absolutely amazing from the beginning right through to the end. During one of the toughest times in our lives, Lindsay led the way and made the process of laying our beautiful mum to rest so much easier; you took a lot of strain and pressure from us and we are so grateful. 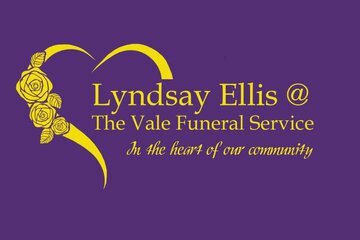 Thank you to Lindsay and the Vale Funeral Service for all your efforts; it did not go unnoticed. I can not speak highly enough of Lyndsay, Ben and the whole team. When you are going through one of the toughest times they are all there to help you make decisions and to guide you through the whole process. They made a very hard day run so smoothly we did not have to worry about anything. Thank you so much from all of us in the Davies family. Very friendly and helpful, made the day for my Dad very special, would recommend them to anyone. Lyndsay was so compassionate and caring to us. He did everything we asked and was very professional. I would highly recommend Vale Funeral Service and would always use them in future. I couldn't fault their service in any way. Thankyou again for everything. Thank you for your review, thoughts and prayers are with you all. I cannot compliment them high enough. Made a very difficult time feel very personal and nothing was too much effort. Thank you Emma for your kind review. I hope that we carried out everything asked of myself and team to the highest of standards we are recognised for. Thank you so much for your kind and appreciated review. The Vale Funeral Service conducted themselves very professionally every step of the way. The service received was excellent and very sympathetic. They advised and recommended the services of others who were also excellent in providing support and helping to deliver a wonderful and touching service for my mother. I would highly recommend the Vale Funeral Service. Lyndsay Ellis and all the staff, did a wonderful service above and beyond our expectations. Lyndsay’ help and support throughout was amazing. The Vale Funeral Service will provide you with a free obituary as part of their service.